In the Gold Versus Bitcoin Debate, Goldman Goes for the Gold! I write and speak a lot on gold. In contrast, bitcoin is my least favorite topic. I’m made my views known many times. Bitcoin is a bubble and will crash and burn, probably to the $200 level sooner than later. It’s worse than a bubble because it’s shot through with bad actors, criminals, market manipulators, fraudulent intermediaries and every species of scam even invented. But, I continually get dragged into discussing bitcoin in interviews, on TV, radio and the internet. So, I discuss it whether I want to or not. By the way, I’m not a technophobe. I use advanced technology every day. Some of my best performing personal investments are fintech start-ups. I’m working with IBM and the Watson super-computer on a third-wave AI project to bring new paradigm predictive analytics to capital markets. I’ve read many bitcoin and blockchain technical papers. I “get it” when it comes to the technology. But, unlike my technologist friends, I also “get it” when it comes to market behavior. I know a bubble or a scam when I see one. Still, interviewers love to get into the “gold v. bitcoin” debate. From my perspective, you might as well discuss gold v. watermelons on bicycles v. bitcoin. In other words, it’s a phony debate. 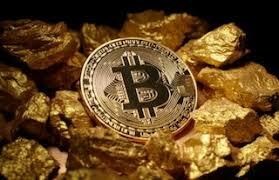 I agree that gold and bitcoin are both forms of money, but they go their own ways. There’s no natural relationship between the two, (what traders call a “basis.”) The gold/bitcoin basis trade does not exist. But, people love to discuss and I guess Goldman Sachs is no different. This article describes a new research report issued by Goldman Sachs that comes down squarely on the side of gold as a reliable store of wealth rather than bitcoin, which is untested in market turndowns. Goldman’s research department has not been notable as a friend to gold, so the fact that they favor gold over bitcoin is highly revealing in more ways than one.